Bundle Convert Plus with your theme at just $24! It’s been over 2 and half years since Convert Plus was launched on CodeCanyon. Over the years, Convert Plus has become the most popular and must have plugin for any WordPress website. With all the necessary features and functions of a lead generation and email list building plugin, Convert Plus has overpowered many existing and expensive solutions. Being a top-selling plugin on CodeCanyon and bundled with reputed themes like Avada, the X Theme, The7 theme and more, Convert Plus now empowers more than 70,000 WordPress websites. Did you know that you can bundle Convert Plus within your theme by simply purchasing the regular license of $24? Read more to know about Convert Plus and how you can bundle it with your theme. Convert Plus allows you to create modules such as modal popups, slide-ins, infobars, inline forms, widget boxes, etc. The point and click editor and readymade templates make it easier for you to design an opt-in form or a desired popup quickly. With triggers like the after scroll, exit intent, inactivity triggers, after post, etc. Convert Plus lets you manage the time when the message should be displayed. You also get advanced targeting options that tracks user behavior, referral URLs, devices used, etc. so that you can display a message depending on the user. This makes sure that you show up the right message to the right audience at the right time. Convert Plus integrates with over 30+ email marketing softwares and CRMs that help store and manage leads within them. More features like the inter-module A/B test, inbuilt analytics, etc. are some things that are loved. Ever since its first launch, we’ve made sure that Convert Plus has all the features the users need. Therefore, with every update, we made it a point to implement all we could. We, the makers of Convert Plus, have made sure that the plugin stands firm with every update and includes features that users a looking for. 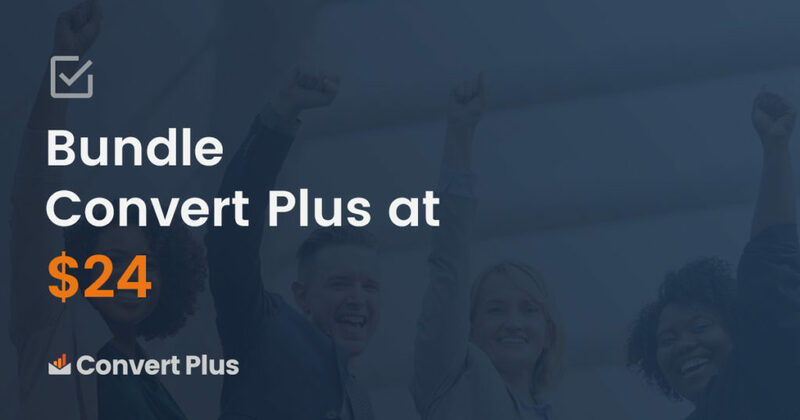 Backed by world class support from expert developers, Convert Plus has earned over 300+ five star ratings simply for being so helpful. Convert Plus is not just loved by the website owners and developers. Top selling themes like Avada, the X Theme, The7 theme and more have bundled Convert Plus within their themes and made it available to their customers. We’ve removed the extended license option that was earlier needed in case a theme wished to bundle the plugin. This means that you can now bundle Convert Plus with your theme by purchasing the regular license that costs $24. Bundle the plugin within your theme and let your users enjoy its features. So cheers to all the themes waiting to bundle Convert Plus within them! I am sure your users are going to love an addition of a lead generation popup plugin within your WordPress theme. Have questions? Please feel free to write to us.